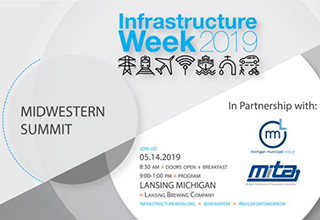 Michigan Municipal League is partnering with the Michigan Infrastructure and Transportation Association to present a summit on the future of infrastructure in Michigan. Governor Gretchen Whitmer and League CEO Dan Gilmartin are among the distinguished key speakers. Topics they'll be discussing include developing a regional strategy for economic success, the future of funding and financing infrastructure, and enhancing regional connectivity. The event will take place in Lansing on May 14. Get the details and register now. For Michigan to truly succeed, we must grow in population as a state. The latest U.S. Census data shows that as a state our population remains stagnant while other states grow. This is a problem. The League's Anthony Minghine writes about it in a recent SaveMICity blog and talked about it on the Dave Akerly Radio Show out of Lansing. Listen to that interview here. We are pleased to welcome Herasanna Richards as the League's newest legislative associate! She will be advocating on behalf of our members in the areas of energy, environment, municipal services, and elections. We're glad to have her on our team. Read more. On this episode of Michigan Politics, Huh? we talk with State Rep. Jim Lilly and State Sen. Jim Stamas, who've worked with the League to make a difference for Michigan communities. They were recently named Legislators of the Year by the League and we discuss the work they did to receive this recognition. Tune in now. The 2018 amendments to the Fireworks Safety Act authorized more local control. Municipalities may enact an ordinance regulating the ignition, discharge, and use of consumer fireworks, including prescribing the hours which they can be used. See our new Fireworks Fact Sheet. Now that medical and recreational marijuana are legal in Michigan, many communities have questions. The League has assembled informational resources including a white paper, sample ordinances, fact sheets, and more on our Marijuana in Michigan web page. More. To read our new 3D Issue "page flip" version of The Review click here. It's a fully interactive, realistic online reading experience!